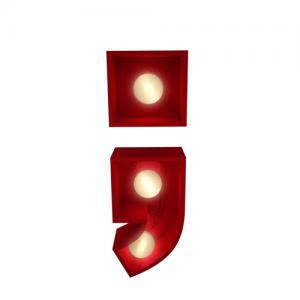 The semicolon is a frequently misused punctuation mark that recently has received some press because it is showing up as an intriguing tattoo among hipsters. First of all, the proper use of a semicolon in a sentence is to combine two complete sentences which are directly related in thought. It can be used in long sentences when a series is long and complex or any one element has a comma within it (separate each element with a semicolon rather than a comma). For example: When bank regulators agree on something complicated, they will often exchange high fives; bank regulators are all about high fives. The writer could have used a period in this place, but because of the direct continuation of the same thought, chooses only to pause. So why a semicolon tattoo? Well, apparently it serves as a reminder to pause, but then to keep on going in one's life and that the next thought will be related to the last. One industry that is currently pausing is the oil industry, due to a dramatic drop in prices. Exactly what comes after the current semicolon here is unknown for now, but the high prices that drove much of the industry's growth until mid-2014 have gone away. There is also evidence that the current low price levels could go on for some time. The Economist estimates that the price of oil could increase, but projects only a price around $66 a barrel by 2019, while countless others are calling for softer oil prices. Even at $66, this barely counts as a recovery considering that prices were over $100 a barrel a year ago. As a result of the price drop, oil industry profits have collapsed and particularly at oil production and exploration firms. Bank regulators are worried, and this drop has brought a coordinated effort to inform banks that a large number of loans issued to oil producers could be substandard. As bankers know, that designation indicates regulators doubt the borrower's ability to repay the loan and/or the value of the assets that are backing the loan. In prior years, regulators mostly did not disagree with banks' internal ratings for reserve-based loans, but this time it is different. Large banks have seen downgrades and regulators are reportedly pushing these downgrades in response to such a significant drop in price (and other factors). Typically, banks internally review the value of oil and gas deposits that companies have the right to extract, and use these as the collateral for loans. Clearly collateral values have changed a great deal with the drop in oil prices so this makes sense. For its part, the OCC's National Risk Committee put oil and gas lending near the top of its list of threats that warrant greater scrutiny. Banks are responding with the reduction of credit lines to borrowers and are updating their collateral pricing far more frequently than twice a year, which used to be the norm. The OCC issued its first guide on oil lending last year, mostly because of the surge in oil and gas lending - up 30% in 2012 and 30% in 2013. This highly technical guide outlines how banks should address industry-specific concerns. Despite these efforts, Fitch notes that the volume of energy debt at the weakest levels of junk bond ratings has more than doubled in a year and is currently triple that for the three next largest industries combined. The Economist notes that the largest firms have cut costs by 20% to 25% and these cost savings have primarily been achieved by squeezing the oil services firms who work for them. Community banks who lend in the oil servicing sector often lend to smaller companies who are likely to suffer the most. The effect can be felt far and wide, as thousands of temporary workers have left towns in TX and ND. There will always be strong demand for oil and gas in the US and around the world, but risk is there too. The current drop in prices is a benefit to many, but has quickly taken a toll on those who live, work and lend in the oil patch. It remains to be seen what comes after the oil industry's semicolon so we will keep monitoring things and know community bankers are too. Treasury yields dropped 2 to 3bps as the drop in commodity and oil prices has muted expectations for inflation. Reports on Housing Starts and Building Permits will give a reading on the housing market. 1) Goldman Sachs will buy the online deposit platform and all deposits of GE's online bank ($16B in deposits) for an undisclosed sum. 2) First Community Bank ($618mm, TX) will merge with Pioneer Bank, SSB ($389mm, TX) to create a larger bank. No terms were disclosed. 3) Bank of North Carolina ($4.2B, NC) will acquire SouthCoast Community Bank ($486mm, SC) for $95.5mm in stock. A survey by the Wall Street Journal finds 82% of economists expect the first rate increase to occur in Sep, while 13% expect a Dec lift off. Bank of America, JPMorgan, UBS, Citigroup, Goldman, HSBC, Barclays, BNP Paribas and Royal Bank of Scotland have all agreed to settle class action lawsuits around foreign exchange currency rigging for a collective $9B. A survey by the ABA finds the most popular ways to bank are online (32%), branch (17%), ATMs (13%), mobile (12%), mail (7%), phone (5%) and don't know (13%). Zillow reports the cost of renting a home in the US has climbed to the highest level on record based on proportion of income and now stands at about 30.2%. This compares to a pre-crisis level of about 24.4%. BizBuySell.com reports the number of small businesses listed for sale jumped 12% YOY in Q2 to a 6Y high. Reasons for the increase cited include improving financials, better sales prices and more baby boomers reaching retirement age. The Wall Street Journal reports auto lending reached $119B in Q2, a 10Y high. A survey by Expedia finds 51% of small business travelers say the frequency of their travel has increased over the past 5Ys. The survey also found the average small business traveler takes 8 business trips per year.